Does your team struggle scoring once your runners reach second? If so, the answer might lie in your leadoffs. Leading off from second base is different from first or third base, so make sure you’re teaching your players correctly to help score more runs. Leading off is leading off, right? Well, not exactly. While runners at every base want to lead off as the ball leaves the pitcher’s hand, they don’t all have the same objective. At second, the runner’s goal is to lead off with the intention to score on a base hit. 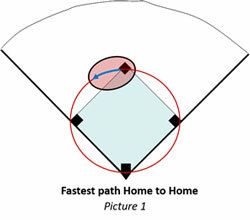 To score from second, it’s important to know that the fastest route around the bases, home to home is a circle. In picture 1 you can see that circle, and while runners won’t run a perfect circle, getting as close to that as possible ensures the runner can maintain her top speed throughout. I was taught to run straight toward a base and then loop out and back in toward the base in a banana-looking angle. And while that was taught a ton (I know I taught it for years), it requires the runner to slow down in order to make that banana-loop, and slowing down isn’t the fastest way around the bases. Knowing that a circle is the fastest way around the bases, you’ll want your runners at second to take their leadoff in an angle back slightly toward leftfield as shown in Correct, Picture 2. This puts them in the position to quickly continue their arc toward third and on home. You can also see from the blue line in Picture 1 how that angled back leadoff puts the runner directly on the circle path toward home. Unlike the Incorrect runner in Picture 2, who by leading off in a straight line from second base must then loop out as she gets near third base which is much slower. While it might not seem like a big deal, every single run you score takes you one step closer to out-scoring your opponents. And that’s a huge deal!